Pull the sheets over your head and hide! There was plenty of gore and strangeness on Wyllis Cooper's Lights Out, and it got even stranger when Arch Oboler took over. 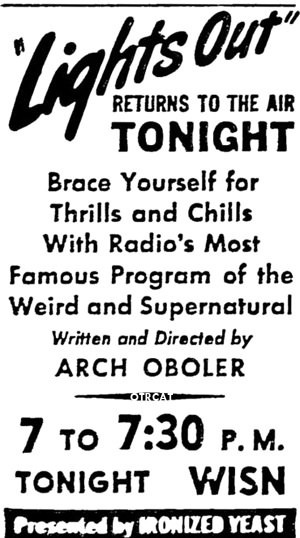 Lights Out debuted in 1934 and was radio's premier horror series created by writer/director Wyllis Cooper, who later scripted Boris Karloff's 1939 classic Son of Frankenstein. Wyllis Cooper was a innovative radio writer and worked on other notable shows such as The Empire Builders, Quiet Please, Campbell's Playhouse, The Army Hour, and Whitehall 1212. Lights Out truly set the bar high for other radio dramas in the 1930's due to its gore and strangeness. It was one of the first old time radio shows that developed the medium of radio with distinct sound effects and dramas intended to be heard. Adhesive tape, stuck together and pulled apart, simulated the sound of a man's or woman's skin being ripped off. Pulling the leg off a frozen chicken gave the illusion of an arm being torn out of its socket. A raw egg dropped on a plate stood in for an eye being gouged; poured corn syrup for flowing blood; cleavered cabbages and cantalopes for beheadings; snapped pencils and spareribs for broken fingers and bones. The sound of a hand crushed? A lemon, laid on an anvil, smashed with a hammer. 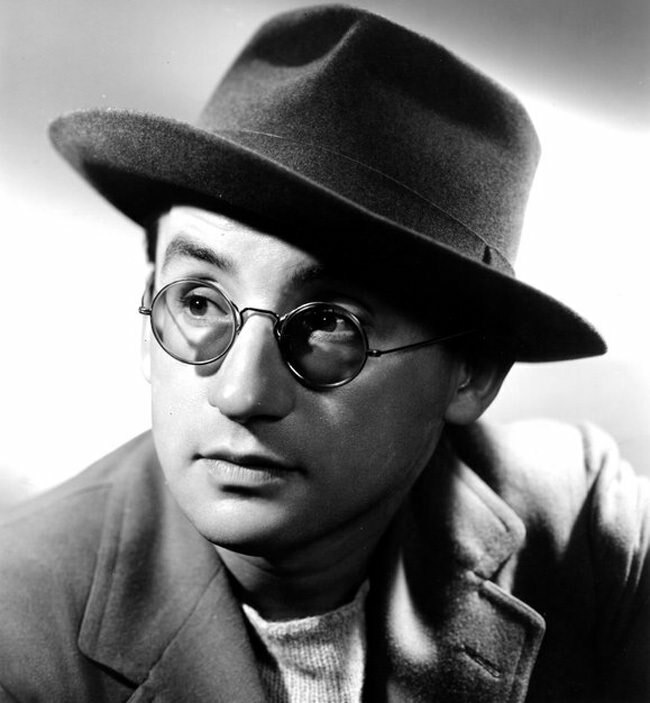 Cooper was succeeded by Arch Oboler, one of radio's greatest dramatic talents. Oboler had scripted the Mae West's infamous "Garden of Eden" sketch and brought a new level of psychological horror to radio in scripts like "Cat Wife," "Sub-Basement," and "Chicken Heart." Though most famous for his film roles, Karloff was an accomplished radio performer who hosted his own series Boris Karloff's Treasure Chest and narrated Radio Reader's Digest broadcasts during the final two decades of his life. See also Dark Fantasy, Escape, Inner Sanctum, Mysterious Traveler, Mystery in the Air, Suspense, The Whistler, and Weird Circle.For more Arch Oboler productions, see also: Arch Oboler Collection, Everyman's Theater, Plays for Americans and Arch Oboler Plays . My German mother got me interested in OTR. When my father was in Europe during WWII she was living in a Tenement flat in NY City with my twin brother and sister who were infants. Her favorite program was Lights Out. She told me that the voice would say "Everybody! Lights out! and she would dutifully do it. The a story would come on and scare her out of her wits. I decided to play my students “The House in Cypress Canyon.” We were currently talking about active listening so I figured it was a good segway. The results were mixed. Some kids really got into it. They asked me questions about it and some wanted me to play more episodes. Others not so much. Few if any were actually scared. Scared the bejesus out of me when I first heard it - late at night while I was in bed. Dreamed about it all night!! My love of audio drama started when my 8 th grade teacher played a casette. I recently found the same story 40 years later on this website. Sent it to texas for purchase next month. I played Leiningen vs. the Ants for my 5th graders last year. I had them illustrate what they were envisioning. Most were pretty into it. I wish I had something like that when I was in school, especially since I took journalism. Lights out? Chicken Heart? Three Skeleton Key? Some of my favorites!!! \"Lights Out\" was one of my family\'s favorite program when I was a kid. We would often turn out the lights and listen to it with just a candle burning. It scared the bejeebers out of us. We were petrified the night Arch brought us \"Chicken Heart\". You are the first person I ever knew who remembered hearing the Chicken Heart story. Until the Bill Cosby routine, I dont think that many people knew it was a real program. Of course, when he heard it, it was a summer replacement program. The original transcription is lost, but there is a recreation of part of it that exists. The scariest story I ever listened to was one called \"Valse Triste\". It was so creepy, I coudn\'t even listen to the end of it. Just caught the last ten minutes of the first episode of \"Lights Out,\" with Boris Karloff. It was a very spooky one. Ken Niles announced it as a new series, then they went to commercial. I was half listening while checking email. Then I noticed they were playing some very joyful, rousing music. I thought the station had switched to the next show...only for Ken Niles to come back, over the music, and announce next week\'s episode. That had to be the most bizarre pairing of music and show I\'ve ever heard.